To reflect the softer side on you, you would need an accessory which has a gentle and delicate type of color shade. 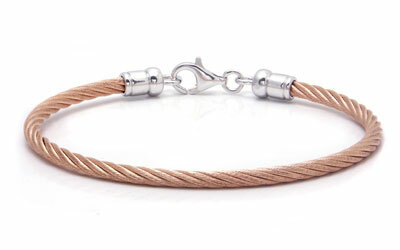 This stainless steel cable with sterling silver bangle is a good choice. The rose color with a smooth touch of golden shade on the bracelet is so chic and unique too. Although the color is a bit unusual, you will be surprised how easy it actually is to complement most of your outfits.